Four different kinds of wine -- Pinot Grigio, Chardonnay, Merlot, and Cabernet Sauvignon -- will soon be available in grocery stores across the country. They're targeted towards new drinkers, those who are passionate about food and haven't tried wine pairings yet. 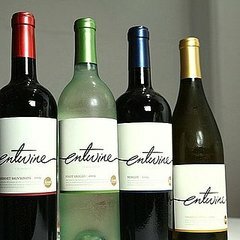 Listed on each Entwine label is a pairing suggestion on what kind of meal might work best with it. For example, the crisp and fruity Pinot Grigio lists guacamole, salty cheese, Asian takeout, fish, and tropical fruit for acceptable pairings, while the juicy plum-and-black-tea Merlot pairs well with meats, pizza, wild salmon, and mac & cheese. Each variety has a 2009 label and is retailed at $12.99. Burrell said that the chance to represent the Entwine line was a natural fit for her. "It's exactly what I do in The Secrets of a Restaurant Chef, make, you know, sort of the unapproachable, approachable and comfortable." She added that a wine for the "beginning customer in mind" wasn't meant to shut out all wine enthusiasts, either. "If you were the beginning customer or wine drinker or an experienced wine drinker, I think it marries both of your palates. But they made it with the idea of 'let's have fun, let's drink wine'!" Apart from the Entwine line, what are some of Anne Burrell's other favorite wines for the summer? She replied, "I'm always a fan of Prosecco, a little sparkly white wine. I drink white wine on the rocks! ... Put a little Prosecco on the rocks and it's like good girl soda. It's just like delicious. Good rosés are really nice, crispy, I'm a fan of Novellino, a fan of Pinot Grigio, Manteno, all what I sort of call 'beach' wines."